Want to meet like-minded individuals? Welcome to the Academy for Lifelong Learning! For more than 25 years, the Academy for Lifelong Learning has attracted members who are intellectually curious, interested in exploring and understanding the world, sharing ideas, and meeting others who share their interests. Feeling the Effects of Cabin Fever? Anxious to Get Out and About After Our Chilly Winter? 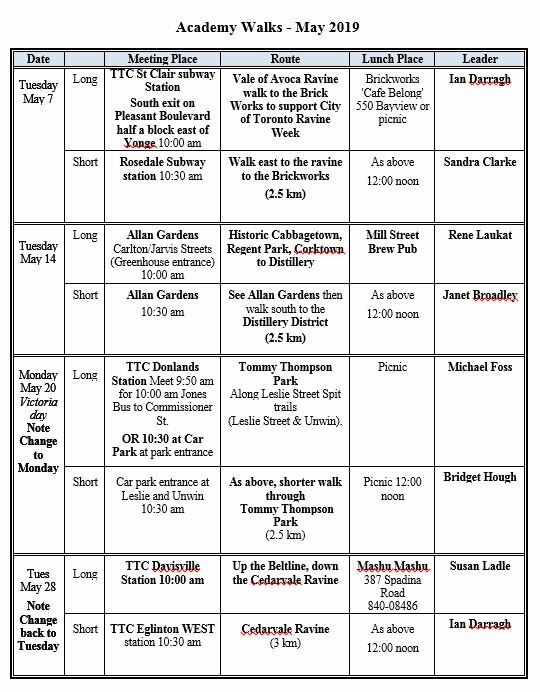 Ken Snelson and his dedicated team of walk leaders have assembled the Walks schedule for May. Join Academy members weekly from May to early September to explore Toronto’s neighbourhoods.